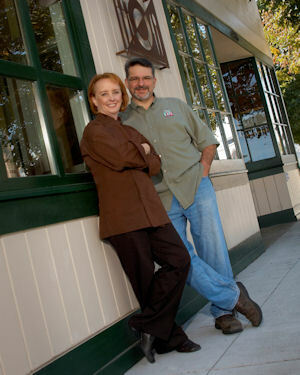 Preferred Sonoma Caterers was founded by Owner/Chef Amber Balshaw and her husband Jim over 25 years ago. Amber’s love of cooking always keeps her excited about food, and that excitement keeps her menus fresh and innovative. Amber has seen trends in food and design come and go (and sometimes come again) over her years planning weddings and other events. She loves to help couples brainstorm new ideas and knows how an event should flow to get everything just right. We prefer to work with local producers and farmers for our produce, cheeses, seafood and as much as we can, to not only provide the freshest products but to support sustainable and artisan practices, and the local community. PSC strives to be an active member of the community, helping through donations and charitable fund raisers, and even founding Petaluma's Art & Garden Festival. We firmly believe in supporting the community we live and work in. With a long history of environmental practices, we were proud to be Certified as a Green Company in 2009. For more information see PSC's community and environmental practices page. Amber is a 5th generation Petalumen and Jim is (nearly) a native as well. Both grew up and went to school in Petaluma, managing to just miss each other on several occasions, until one day in their last year of high school. Both left Petaluma after attending SRJC; Jim for UCSB, and Amber for an apprenticeship in Innsbruck Austria, followed by the Culinary Institute of America in New York. After getting married they worked in southern California for a time, until the call of home was just too strong. They always say if they didn’t live in Sonoma County they would vacation here; it is a beautiful area! During her globe hopping Amber has worked in Innsbruck, at West Point Military Academy, and at the Ojai Valley Inn, among others. She has cooked for three US Presidents, other dignitaries, and a multitude of stars. Notable events for PSC have been catering for the audience at Emeril Lagasse’s San Francisco Special, on location for a John Travolta movie, and a single 3 day long party! More commonly we cater weddings, cocktail parties, and business events for 30 to 1500 guests. Preferred Sonoma Caterers is located in "The Retro Warehouse District" in mid-town Petaluma at 416 East D Street. Having moved to the current facility in 2009, completing a remodel of this circa 1911 building and receiving a Heritage Homes award (Building History). The kitchen is open to public view for those interested in seeing the bustle of a busy catering company. The showroom has photos from many of PSC's events and samples of many serving and display pieces.